Your primary goal in a Product Marketing Manager role is to create demand for products through effective messaging and marketing programs. If you do your job well, the product has a shorter sales cycle and higher revenue. Market strategy expert: Market strategy lays the foundation for market success. It is the high-level thinking, planning, and research that happens before a product goes to market. The Product Marketing Manager has an in-depth knowledge of target markets and how to best introduce the product into each market. Product Marketing Managers use market research and competitive analysis to develop market strategies. Marketing expert: In conjunction with the marketing communications department (also known as marcom), the Product Marketing Manager’s goal is to convince customers to demand or pull your product through to sale. As a Product Marketing Manager, you know marketing principles and techniques to create a marketing communication sequence that leads to sales. Marketing program guidance: In conjunction with the Product Manager, the Product Marketing Manager outlines the product positioning which articulates the value proposition. This is further detailed in the messaging which links each feature to a customer-oriented benefit. Supporting sales: Sales convinces customers to buy your product; they generate market push. To do so effectively, sales folks need great sales tools. For example, they often need good product training, a solid product presentation, and a compelling demonstration. A Product Marketing Manager knows what sales tools salespeople need to get their jobs done and what points to emphasize so that the sales pitch is more successful. Beware: Some companies expect you to do both Product Management and Product Marketing plus the entire marketing role all by yourself. That is a daunting task and an even broader set of skills to learn. Product Marketing Managers drive action through the company mainly through written documents supported by presentations. Here is a list of the most common documents that you may be asked to create. Be aware that each company has their own specific list and terminology. 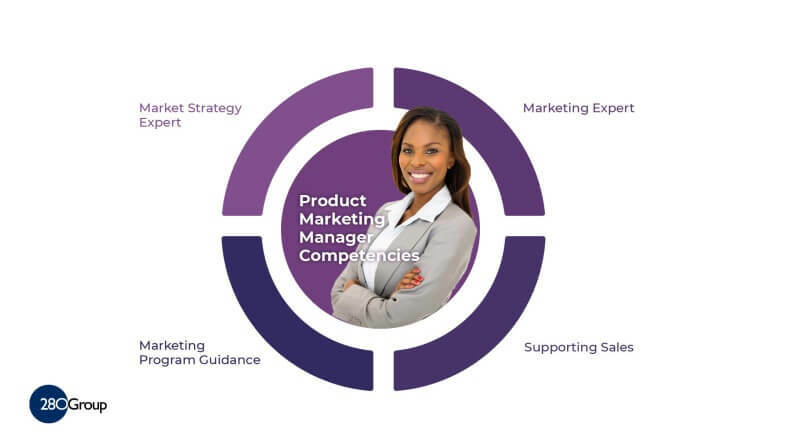 Product Marketing Managers call on a wide range of skills and have a broad set of business and product experiences to call on. Here is a list skills managers look for when filling a Product Marketing Manager role. Many Product Marketing Managers have a bachelor level degree in the industry that their product serves or in Marketing. Some also have MBA or additional business training. This role of Product Marketing Manager provides one of the best training grounds for moving onward and upward into roles such as vice president of marketing or transition into Product Management. And if you’re lucky and choose carefully, you get to work with some pretty talented Product Managers and marketing teams to launch products that delight your customers, make a huge difference in your customers’ lives, and help achieve profits and strategic objectives that propel your company to success. Want to learn more about the Product Marketing Manager role?